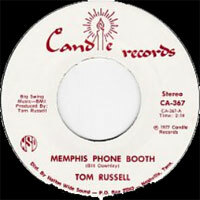 Chanteur Country US né Thomas George "Tom" Russell, le 5 Mars 1951 à Los Angeles (Californie). 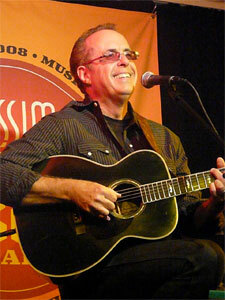 Americana singer/songwriter Tom Russell was born in Los Angeles in 1953. Raised on the cowboy music of the American West, he grew up to be a talented songwriter, and began issuing albums under his own name in the early '70s. However, Russell's material was also recorded by such luminaries as Johnny Cash, Guy Clark, Dave Alvin, Doug Sahm, and K. D. Lang, to name only a few. While much of Russell's work mined the country tradition, he was also known to flavor his work with Tex-Mex, folk, and the cowboy music of his youth. After an acclaimed career spanning two decades, Russell found another gear with 1999's Man from God Knows Where. A concept album eight years in the making, the LP presented a song cycle inspired not only by America's pioneers, but by Russell's own immigrant ancestors. Borderland, a set inspired by Russell's newfound home in the Juarez border region of Texas, followed in 2001. Modern Art appeared in April 2003 and Hotwalker -- a conceptual work inspired by Russell's encounters with author Charles Bukowski -- followed in 2005. A year later, Russell released Love and Fear, an album focusing on what he called "the ragged outback of love." Wounded Heart of America, a compilation of Russell classics performed by everyone from Johnny Cash and Iris DeMent to Tom himself, arrived in 2007. In 2009, Russell re-emerged on Shout Factory with Blood and Candle Smoke, recorded at Tucson's Wave Audio with owner Craig Schumacher co-producing. Players include songwriter Gretchen Peters on backing and duo Vocalss, and members of Calexico, among others. Following the critical and commercial success of Blood and Candle Smoke, Russell toured relentlessly. Included in his road escapades was another train tour, with songwriters Dave Alvin, Steve Young, and Thad Beckman. Russell went to work on another album in 2010; he recorded in studios in Texas, Los Angeles, Tuscon, and Nashville with co-producer Barry Walsh. The end result, Mesabi, once more included appearances by Calexico, as well as Van Dyke Parks, Viktor Krauss, Will Kimbrough, and Gretchen Peters. The album was advanced by a pre-release download single; a striking cover of Bob Dylan's "A Hard Rain's Gonna Fall," featuring Lucinda Williams and Calexico. The album's final cut, "Road to Nowhere," was used as the title cut of the for director Monte Hellman's film of the same name. Mesabi was released on September 6, 2011. Russell spent the next couple of years painting and touring -- often on trains with other artists including Peter Case and Dave Alvin. His next offering was the iconoclastic Aztec Jazzin 2013 with the Norwegian Wind Ensemble. It was followed by the unprecedented Rose of Roscrae; "the first frontier musical written in the West, by a westerner." The set included 25 new songs and traditional numbers performed not only by Russell but an extended cast that included Jimmie Dale Gilmore, Joe Ely, John Trudell, Gretchen Peters, Tex Ritter, and a dozen more. It was released in April of 2015. Russell paid homage to another of his favorite acts, the iconic Canadian folk duo Ian & Sylvia, with his 2017 album Play One More: The Songs of Ian & Sylvia. The album featured Russell's interpretations of 12 of their classic tunes, as well as two rare studio demos from the duo. The following year, he released Old Songs Yet to Sing, a collection of his own classics re-recorded in a warm, acoustic setting featuring guitarist and long-time collaborator Andrew Hardin. 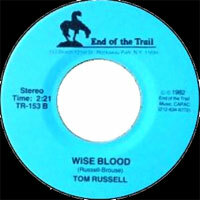 In 2019, Russell issued October in the Railroad Earth, titled after an iconic prose piece by Jack Kerouac. The album comprised nine Russell tunes, including "When the Road Gets Rough," penned with his wife Nadine, and the title cut for the Irish independent film Small Engine Repair. It also included a cover of "Wreck of the Old '97." Russell's backing band for the date included lead guitarist Bill Kirchen, Eliza Gilkyson, and Los Texmaniacs. Russell described the songs and sound as "Jack Kerouac meets Johnny Cash...in Bakersfield." 1977 SP CANDLE CA-367 (US) . 1993 SP Sonet RUSS05 [NW] (promo) . Gunpowder Sunsets - The Tom Russell Anthology 2 - Honkytonk Heart (Like Mine) / Spanish Burgundy / The Road To Bayamon / Love Abides / When Sinatra Played Juarez / Tijuana Bible / East Of Woodstock, West Of Vietnam / Nina Simone / Don't Look Down / Mesabi / Sterling Hayden / Guadalupe / Finding You / The Rose Of Roscrae / Hair Trigger Heart / He Wasn't A Bad Kid, When He Was Sober / Resurrection Mountain / Iron Eyes Cody / Where Do All The Cowboys Go?